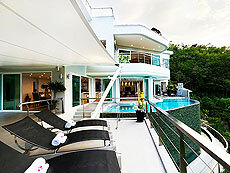 Villa Beyond is a luxury rental villa that located on a small hill, look over Bangtao area. The villa becomes a building of 7 Bedrooms with fully equipments and interior with private pool. Each rooms have Media player and Network audio that bring you deeply relax with your favorite music. Villa Beyond could arrange wedding, party and other your special requests. The villa good for family and groups stay. to Downtown : A 10-minute by taxi to the center of Laguna Complex.